Once you’ve set up My Class you can add students as users to your class blog. You add students as users to the class blog if you only want students to publish posts on the class blog and don’t want to your students to have their own individual student blogs. Students are automatically added as users to a class blog when their student blog joins the class blog. 2. Add the student username, email address, and their password (optional) and click Submit. If you do not enter a password, one will be automatically created for them. Also, you can click Add More in order to add additional students, and then click Submit once they are all added. 3. Once you click Submit, students are added to Users > All Users and are assigned the role of Student. The Student role is controlled by the settings you have set in My Class > Class Settings. 2. 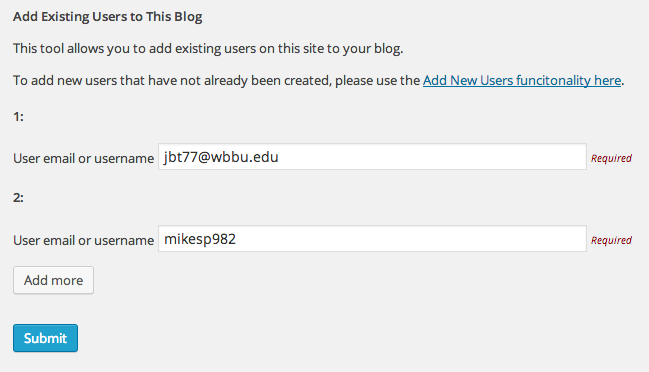 Go down to the “Add Existing Users To This Blog” and enter the email or username of the existing user. You can click Add More to add additional users. Once you have added all of the users, click Submit. 3. Get your students to log into their Edublogs account and click on Join Class blog under Invitation in their admin bar. 4. Once students have accepted the invitation they will be added to Users > All Users and are assigned the role of Student.